This is an update of a deal already posted by someone else. Today HP has further slashed the price of its 10 inch tablet (wi-fi version) to £129 (£123.84 with code), and the price of the 3G version to £149 (£143.04 with code). The code is 4OFFHP. Was thinking of getting an ipad air as my ipad1 is getting annoying, is this HP slate any good? OMG. HP is really going for it at the moment. £120 is absolutely brilliant for a decent 10" tablet, normally you only get chinese crap for this price. HP have decent products, but non-existing marketing and brand awareness. If this was a Samsung tablet at this price, there would be riots on the streets. perhaps you'd like to suggest a better branded & spec deal for this price then? After my recent DOA purchase of the HP Slatebook from Tesco, not for me! voucher not working for me. I was looking for a tablet for my mother's 70th birthday. My mother has always been somewhat scared of the pc (which she uses for very basic tasks like Skype) and does not have perfect eyesight anymore, so I was looking for a cheap 10inch screen but I did not want unbranded chinese tablets. 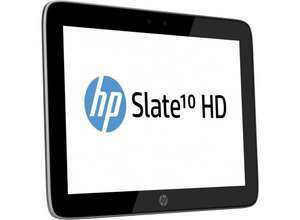 HP Slate 10 HD at £123 ticks all the boxes for me. voucher not working for me.E-voucher is not valid. I used it one hour ago and it worked for me. What's better, this or the Nook hd+ 9"? I had considered the Nook hd+ 9" too. The main problem is that the Nook hd+ does not have a front camera, which is an essential requirement for me since we make Skype video calls every day. Moreover I have read that Barnes&Noble has discontinued support for that product. Just a few comments on the Nook HD+: light as a feather, just the right size and the screen is simply stunning. Against - limited in apps it seems to run, more so than most other Android tablets. Also a funny plug for charging. This looks good - heat. Seems worse to me at first glance! 2-cell (26 WHr) Li-Ion polymer battery... does anyone know how long it last if watching video ? Just a few comments on the Nook HD+: light as a feather, just the right … Just a few comments on the Nook HD+: light as a feather, just the right size and the screen is simply stunning. Against - limited in apps it seems to run, more so than most other Android tablets. Also a funny plug for charging.Build quality absolutely excellent.This looks good - heat. Nook HD+ can be modded to run 'normal' version of Android 4.4, giving you access to all android apps/playstore. Probably can do the same with this HP too but I love the Nook HD+ screen quality. review here , bad points: low ppi of 149., only dual core, low resolution. the rest seems ok even battery. clearly at £123...its excellent. Just i never tried in person, the reviewer say it appears pixelated. the price is too tempting... what you guys think ? Any review of this will be at a much higher price point. This is obviously not a top tablet, but a significantly better tablet than this is going to be at least £200. At £123 or £143 with 3g this is an absolute steal. I wish it was this price 6 months ago when I needed one. In the end you can always send it back if you don't like it. argh ..Get behind me satan. I love my Acer A210 ,get a lot of use out of it but I wonder whether this would be a better tablet. Is the 3G version with Data Pass? Because that would be a good deal. The WiFi version is just so so, and the price is ok, but nothing great. Was thinking of getting an ipad air as my ipad1 is getting annoying, is … Was thinking of getting an ipad air as my ipad1 is getting annoying, is this HP slate any good? If it's a question of whether an iPad Air or this.....there's only one winner. I had considered the Nook hd+ 9" too. The main problem is that the Nook … I had considered the Nook hd+ 9" too. The main problem is that the Nook hd+ does not have a front camera, which is an essential requirement for me since we make Skype video calls every day. Moreover I have read that Barnes&Noble has discontinued support for that product. The Nook HD+ is great - you can get it used in good condition below 100 pounds, even the 32GB version. Install CM, and you always have an up to date Android. It is also very sturdy, and battery life is good. Is it worth replacing the Galaxy Tab 2 10" (wifi) for this? OMG. HP is really going for it at the moment. £120 is absolutely … OMG. HP is really going for it at the moment. £120 is absolutely brilliant for a decent 10" tablet, normally you only get chinese crap for this price. HP have decent products, but non-existing marketing and brand awareness. If this was a Samsung tablet at this price, there would be riots on the streets. This or the galaxy tab 3 8inch? Stop messing about and get a nexus 7 or CYANOGEN modded nook HD+ imo. I think they're fairly similar in spec. I just sold my Galaxy Tab 2 10" recently and have been looking for a better tablet for a decent price. Unfortunately I'm not exacntly in the money right now for a Pro Tab but need a tablet for the house so this one might just do the job for now. It's a decent buy if you want a large tablet on a limited budget, but we'd probably stretch a little further to get a better screen. This or the nexus 7 32gb 2012 at £129.99 from Argos? Gotta feel bad for all those who bought it last week when it was £149, as some had difficulty with the code. I told myself I didn't need a 10 inch tablet, but for a branded one, this is tempting. Either this or the Hannspree one at Asda, potentially £89 with that PayPal code/thingy. how does this compare to the £80 Medion Lifetab 10' that was on here the other day? Just ordered for my son - thank you. Great price for this HP kit, especially with the 4% voucher and don't forget cashback as well.